Ladysmith Harbour has a calm bay with one of the most picturesque views this side of Vancouver Island. On its far side there is a serene beach that only a few locals are aware of called Elliott’s beach. Reservation Required: To avoid disappointment, please contact us at least 24 hours prior to your desired tour time. Additional Information: Bring a lunch or some snacks to enjoy while we spend some time at Elliot’s Beach. Cost: $105.00 per person plus GST. Once you are comfortable in the kayak and safety is assured, the adventure begins! 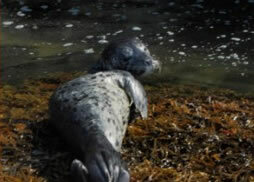 We will travel together to Woods Island where many of our harbour seals like to poke around and check out visitors. Paddling along the sheltered shoreline to Bute and Dunsmuir Islands we will stay in the shallow waters and and seek out resident sea stars, sun stars, oysters, crabs, moon snails, limpets and the neighbourhood river otters. 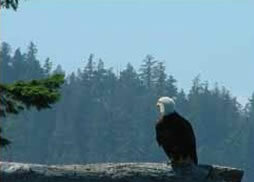 When you look up, you will most likely spy bald eagles, herons, oyster catchers, cormorants, and many other sea birds. Our certified kayak guides will fit you into your kayak, your PFD (personal flotation device) provide a complimentary basic paddling skills lesson onshore to help you get in an out of your kayak. 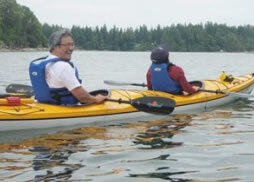 Our guides work with all levels of kayakers daily and enjoy making your paddling experience more enjoyable by providing some additional paddling techniques while you are kayaking to Elliott’s Beach.